Business owners, are you buying or selling your business? Reproduced with kind permission from Nursery Management Today May/Jun issue 2014. Other articles from their latest issue can be downloaded by following the link above. The most significant change nursery owners are likely to face is expansion or the sale of their business. Carol Cheesman advises on the financial implications of these life-changing decisions. 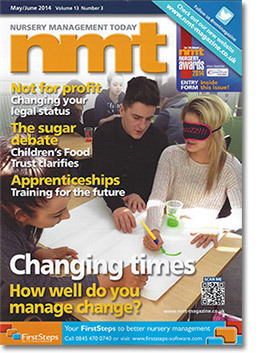 This article was first published in NMT and consequently aimed primarily at Nursery owners but the advice is applicable to all business owners. If you are planning to expand, re-launch or even sell your nursery business, then inevitably there will be changes – some financial – that you will need to manage. In the case of expansion or a re-launch, some of those changes may require additional funding. So, it is really important to understand how you can prepare before seeking finance. The business’s accounts are key to obtaining finance, and should be both a factual document, prepared in accordance with the relevant legislation (for example, the relevant Companies Acts), and a sales document. They should be clear and up to date, outlining in detail how the business has operated in the last year and the plans for the future. If the accounts show a poor result, you should explain how this is being overcome and how it will be different in the future. Finance providers need to understand why you need the money; how it will be spent; what contribution you and the company are making; and how, and when they will be paid back – and over what period. what does the business need the money for and how will it benefit the business? can the business afford the interest payments? can the business afford the capital repayments? if you are under-capitalised, then maybe a medium-term investor in the form of loan notes, would be the solution. how the business is planning to minimise this risk. The costs associated with a relaunch or expansion are likely to be high and, therefore, whether these costs are tax deductible is certainly relevant. In general, if a business buys an asset, the expenditure for such cannot be deducted from trading profits. However, reliefs and allowances may be available. Capital allowances give tax relief for the reduction in the value of assets that are purchased for business use. The cost can then be written off against the business’s taxable income. One of the main capital expenditure items that qualify for capital allowances is equipment (otherwise defined as plant and machinery). This can include furniture, office equipment, computers, tools, equipment and vehicles. Certain fixtures, fittings and integral building features such as electrical wiring may also qualify. Another capital expense that qualifies for capital allowances is buildings and the renovation of such, all of which are relevant to relaunch and expansion. an asset must be expected to last for more than two years. There are three different types of capital allowances available: the Annual Investment Allowance, First Year Allowance and Writing Down Allowance. The relevance of each allowance will depend on the nature of the business’s re-launch or expansion. The Annual Investment Allowance is available for most plant and machinery and allows the full cost of the asset to be written off against profits subject to the maximum limit per year. The maximum amount that can be claimed is £250,000 per year. First Year Allowances provide relief at 100 per cent for certain types of assets. In other words, the business can claim the full expenditure on the assets as a deduction when calculating taxable profit. Writing Down Allowances reduce the balance of qualifying capital expenditure that hasn’t been claimed under the Annual Investment Allowance or First Year Allowance. The application of these allowances is beyond the scope of this article, but, clearly, they should be considered in detail when planning the costs of a re-launch or expansion of your nursery. If looking to sell your nursery business, it is important to consider the business’ accounts as a sales document and to prepare and use them in the same way as you would when preparing to seek finance. Full, rather than abbreviated, accounts are crucial. You will also need to comply with The Transfer of Undertakings Protection of Employment Regulations 2006 or TUPE, which entitles employees to the right to work under the same conditions and contractual terms as thev did before, without it affecting their period of continuous employment, it is the responsibility of the current and prospective employer to ensure all employees’ rights are protected. You’ll make a profit on the sale of your business, and, if so, you will have made a capital gain, which may be taxable. Now, the rate of capital gains tax depends on your annual income. If you are a basic-rate tax payer (receiving up to £32,010 gross income per year) then the tax rate is 18 per cent of the total gain. If you are a higher-rate tax payer (receiving above £32,010 gross income per year) then the rate is 28 per cent. However, every individual, irrespective of their earnings, has an annual capital gains tax exemption of £10,900 (for the 2013 -14 tax year). If you have other investments outside the business, then you should take into account whether you will be making a gain on these during the tax year that you are selling. If so, then it would be worth considering timing the disposal of these assets in order to maximise the capital gains tax allowance. This might mean delaying the realisation of these assets until the following tax year. As always, it’s worth getting professional advice, and the earlier in the process, whether you are expanding, re-launching or selling, the better.